In classical communication, such as email, text message, or phone call, a message is embedded in an information carrier, such as a particle or signal, that travels in only one direction at a time. In order to communicate in the other direction using the same information carrier, it is necessary to wait until the particle arrives at the receiver and then send the particle back to the sender. In other words, it is classically impossible to perform two-way communication by using the single exchange of a single particle. However, this is exactly what Del Santo and Dakić theoretically show. To do this, they use a quantum particle that has been put in a superposition of two different locations. As the physicists explain, being in a quantum superposition means that the quantum particle is "simultaneously present" at each partner's location. Therefore, both partners are able to encode their messages into a single quantum particle simultaneously, a task that is essentially impossible using classical physics. "Consider the simplest scenario, where two players, Alice and Bob, want to exchange a simple bit of information, i.e., either 0 or 1," Dakić explained to Phys.org. "They encode their respective bits (messages) at the same time, directly into the superposition state of a quantum particle. Once the information is encoded, the partners send their 'parts of quantum particle' towards each other. Positioned halfway in between Alice and Bob is a unitary device, which may be experimentally implemented by, for example, a beam splitter. "Conditioned on the messages that the particle carries, when the particle hits the unitary device, it bounces back either to Alice or Bob deterministically," Dakić said. "More precisely, the unitary device guides the particle a 'smart way,' such that, at the end both Alice and Bob get the bit (message) that has been sent to them. For example, if the particle ends up with Alice, she would know that the Bob's bit was just opposite from her bit, and vice versa." So in the end, both players send and receive a message—all within the same amount of time it would take to send a one-way message using a classical particle. 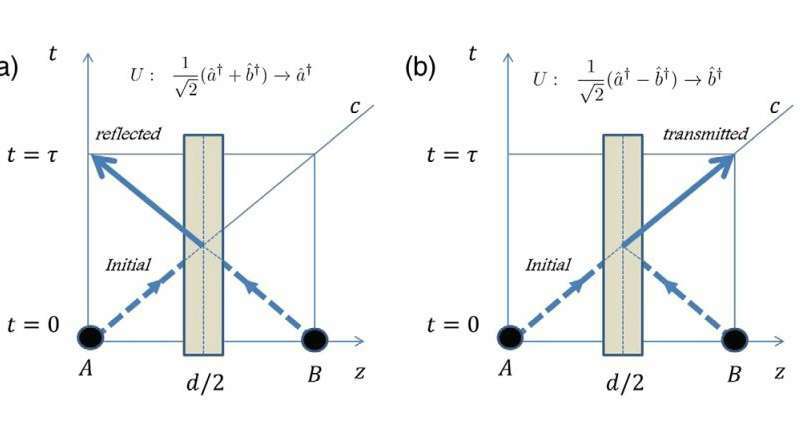 These theoretical results have already been verified by a new experiment using single photons, reported by Del Santo, Dakić, and their coauthors. The experimental results further strengthen the new concept by showing that the communication is secure and anonymous. In particular, the direction of communication is hidden—an eavesdropper cannot tell who is the sender and who is the receiver. Consequently, the results may lead to improvements in quantum communication that has advantages in terms of both speed and security. The enforced temporal coherence of the signalling provides the second variable which allows two signals on an otherwise single quantum. Otherwise you don't know when to measure and when a transition between bits happens. Its effectively a quantisation of time. You could only cheat this time quantisation and sent asynchronous bits by sending more photons to allow data clock regeneration at the receivers. This is just what we'd expect if isolated particles decohere temporally. The point at which decoherence and later coherence occur are adjacent. classical and quantum information processing.